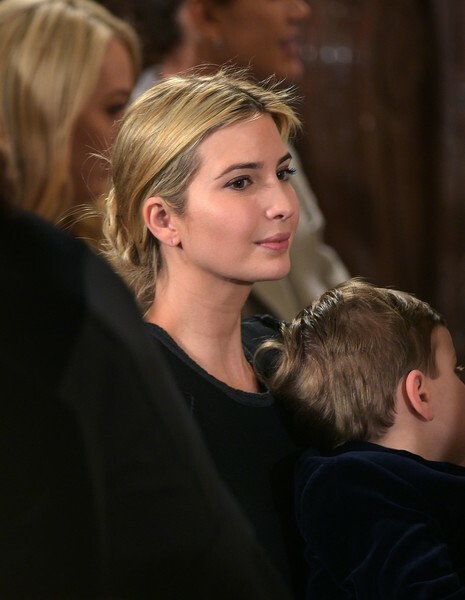 Ivanka Trump attends the White House senior staff swearing in at the White House on January 22, 2017, in Washington, DC. *Suddenly, Ivanka Trump items on Neiman Marcus’ website are nowhere to be found. 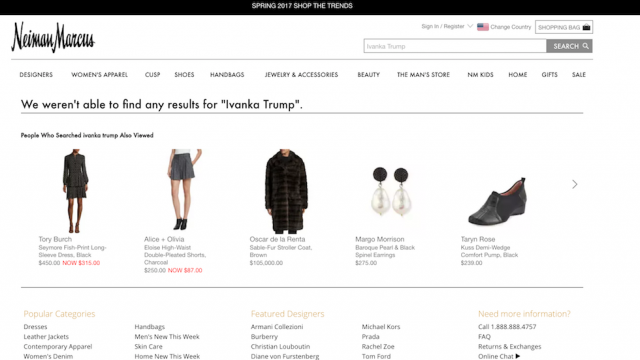 According to People.com, more than a dozen jewelry and accessory items designed by the First Daughter, including a $12,000 bracelet, have vanished from the retailer’s site with no explanation. The ghosting comes in the wake of Nordstrom’s announcement Thursday (Feb. 2) that it had decided not to sell Ivanka Trump’s products for the spring season, due to poor sales. Nordstrom had primarily sold her shoes online. A Trump rep told Fortune in October that total revenue for the Ivanka Trump Collection–including footwear, jewelry clothing–for fiscal 2016 was up 37 percent over the previous year, and monthly visitors to the brand’s website increased by 50% over the same period. However, more than half of women in a national poll said they would consider purchasing boycotting Trump’s clothing line, with that number rising to 75 percent among Democratic women. Neiman Marcus is one of dozens of manufacturers, hotels and retailers targeted by protest group Grab Your Wallet, which launched in October with the mission of urging boycotts of companies either owned by the Trumps, that carry Trump-branded clothing and accessories, or that have offered financial support to President Trump’s political campaign. In addition to Neiman Marcus and Nordstrom, Grab Your Wallet has urged Amazon and Zappos to stop selling Trump family products. GOOD, I AM GLAD THEY GOT RID OF HER LINE!!!!! !